Otherkin Awakening is a real exposé on the Otherkin scene and its members. The book goes well beyond the bounds of fiction to really investigate the counter-culture and spirituality of people who consider themselves not to be human. Get to know Anya, Marc (and his hunky mentor, 'Van') right away by downloading the first chapter of Otherkin Awakening, totally free, no catch. Right-click the link above and select 'Save Target As...' or just click as normal and open it directly. You will need Adobe Acrobat Reader to view this PDF file, get Acrobat Reader free now. Where are the other chapters? Well, if you'd like to track the progress of Otherkin Awakening, please check the chart, which is updated daily. Otherkin Awakening tends to creep forward 4% each and every day. Otherkin Awakening will soon be available as a PDF download, so you can enjoy the entire novel electronically, or printed out. Soon, we hope to present Otherkin Awakening as a real-life book, and you'll be able to order it from us directly. 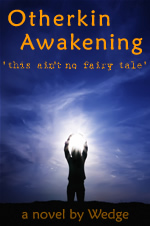 Publishers and distributors interested in Otherkin Awakening for any reason should contact the author directly. Anya took a quiet breath and tried to organize her thoughts, but she began to feel the pressure with the three of them sat staring at her, waiting for her to perform. The room was a dump, not big enough for any of the regular team meetings – it felt like a police interview room, bare and neglected. Actually, it was quite cool in here, draughty even. Anya shifted with discomfort as her spine stretched and her abdomen clenched. The seconds were stretching out; the three stooges in front of her seemed frozen in a state of mild disdain. Her eyes scanned around looking for inspiration, but the room only echoed the engulfing blankness. Her breathing quickened in her tight chest and she felt a little light, somewhat distant. Echoes of nothing found her ears, and her eyes sought out the wisps of hair on Brian’s and then Monica’s cheeks, her eyes grew narrow and then wider as they took in the colors that were streaming from each hair, contour and line on their faces. Wisps, smoke-like trails of translucent color streams surrounded the three managers, each had their own signature shapes and hues; Monica had a dull glow with dark yellow and brown eddies whirling up from around her midriff; Brian was surrounded by subtle shades of lavender and blue, while James Fenton was the center of a nimbus of electric blue just hovering over a deep dark red outline, close to his body’s outline. Wedge writes for several websites and manages a UK based charity and so he speaks at conferences and delivers dozens of training sessions a year on the subject of mental well-being. His writing manages to be both serious and intriguing, touching on the darker side of life with a light touch. This website it available in two themes - Bright & Dark. You're currently enjoying the Bright theme, which makes use of American English. Would you like to switch to the Dark theme, which uses International English for the UK audience? Copyright © 2007 Wedge. All Rites Reversed.